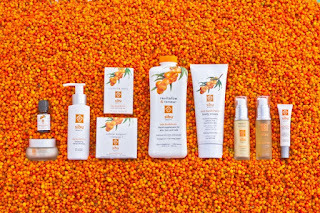 Introduced in 2009, Sibu Beauty debuted their product line comprised of a powerful whole food source, the sea buckthorn berry. Improving skin tone and texture, as well as aiding in healthy aging and digestive health, this powerful fruit is backed by over 130 scientific studies. Taking note of this super fruit, Sibu Beauty has created a line that helps your skin look and feel it's best! What sets Sibu Beauty apart from other beauty products is not only it's sea buckthorn berry ingredient, but also the fact that all of their products are 100% natural USDA certified organic and are recognized as cruelty free. Sibu Beauty was awarded the Safe Cosmetics Certification from PETA. Sibu Beauty is also preservative, dairy, wheat, gluten, sodium, and paraben free! Thanks to the wonderful folks at Sibu Beauty I got to try out their Sea Buckthorn Cleanse and Detox Bar. 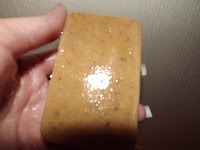 This facial soap is great for cleansing and detoxing the skin, revitalizing skin cells, and conditioning the skin. This bar also works as a natural astringent and works to inhibit bacterial growth on the skin. When I first heard of this bar I was really excited. 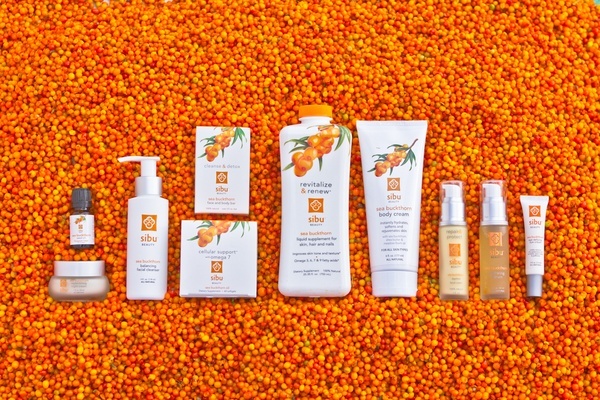 I had never heard of, nor tried any beauty products containing Sea Buckthorn, so after reading all the benefits of this powerful fruit I was ready to try it out! The first thing I did of course when the bar arrived was smell it. I love beauty products that have a pleasant fragrance to them. 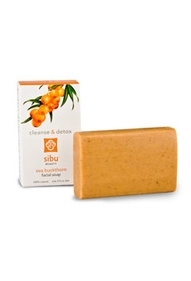 The Sibu Beauty Sea Buckthorn Cleanse and Detox Bar smells fantastic! It's a very light orange-lemon fragrance with the sea buckthorn leaves that give this bar a "clean" smell to it. Love it! Bottom line is so far this bar is a keeper! It leaves my skin feeling soft and best of all - clean. I like to use this bar at night to wash off my makeup before bed. I look forward to seeing the long term results from using it. I would recommend this product to anyone looking to add a new and effective beauty product to their skin regimen. Want A Chance To Win A Sibu Beauty Cleanse and Detox Bar? (1) Lucky reader of Textbook Mommy is going to win! Giveaway Details: Open to U.S. Residents, 18 years of age and over. Winner will have 48 hours to respond to winning email or an alternate winner will be selected. Entry is via Rafflecopter form below. The form make take a moment to load. Good Luck! * Disclosure: I was provided a sample product from the above named company in exchange for my honest opinion. All opinions expressed in this review are 100% mine and are not a result of any outside influence.